The only grievance of Robertson’s was that he couldn’t drink his hot tea with them in! The story of these “wild teeth” spread and led to the telling of a tall tale of Robertson killing a bear, making the teeth, and eating the bear with its own teeth! I’ve come into the lab on many occasions to find some pretty intriguing objects that are so eclectic and unique, that I simply had to share. Last week I discovered a set of dentures on our lab shelf and I had to know more! Turns out, they belonged to Erwin A. “Nimrod” Robertson, an early Alaskan pioneer from Maine who settled along the Yukon near Eagle in 1898. 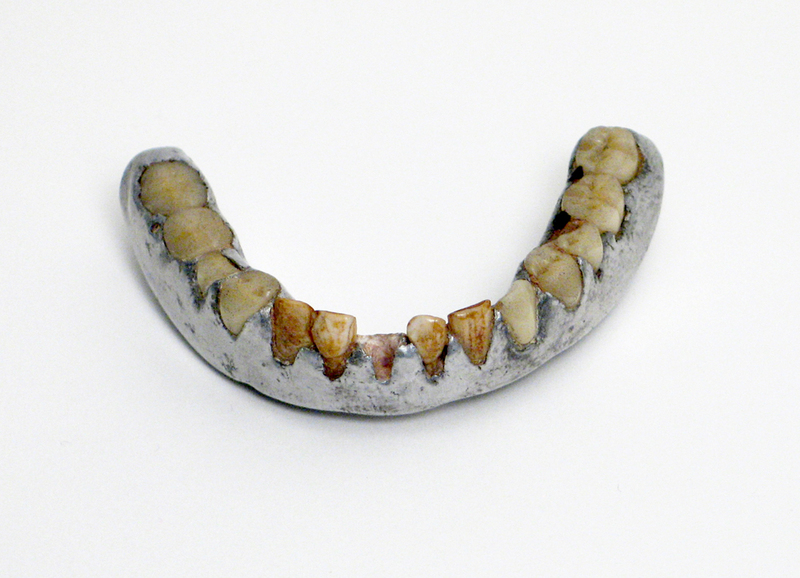 He used his homemade teeth, forged from an aluminum pot lid set with a mix of carved sheep, caribou, and bear teeth, for about 25 years. Over the forty years he spent in the Eagle area, he had many occupations including placer mining, dentist, jeweler, as well as serving on the Eagle Common Council, Chief of Police, marshal, magistrate, and attorney. Because of his inventive genius, he was an all around tinkerer, making inventions and fixing things for people. “Nimrod”, an endearing nickname given to him, was quite the resourceful genius and the teeth were just one of his many inventions. He made hunting blades from large wood files that were tempered by a secret processes. It was said that these knives would trim the corrugation off a silver dollar as easily as an orange peel with a paring knife. He was well known for his gold puzzle rings and would give it away to anyone who could take it apart and put it together again within a specified time. 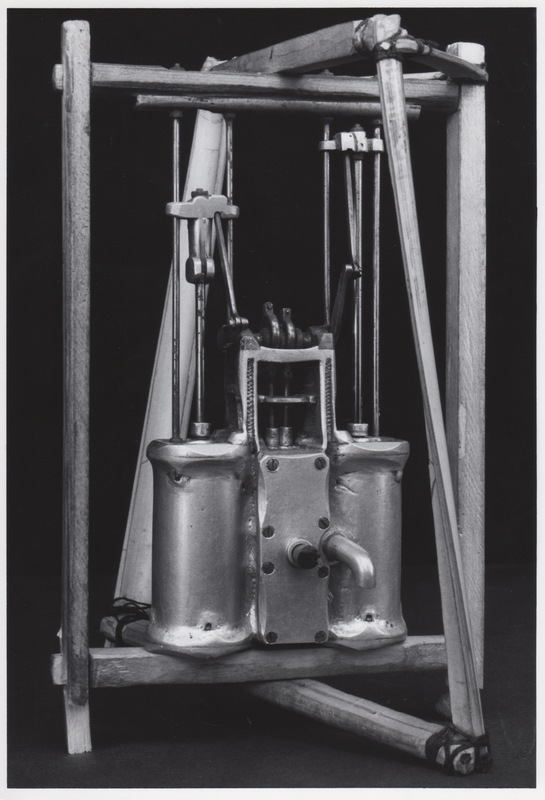 In our collections we also have an aluminum motor that he fabricated to go along with an early airplane he engineered called “Nimrod’s Bird Machine” that he had patented in 1892 or 1894. Another of his creations is a famous and impressively accurate 60”x 80” relief map of the Eagle area, which he constructed from newspaper, magazines, hematite and moose blood. The map was sent to Seattle in 1909 for the Alaska-Yukon Exposition and again in 1962 for the World’s Fair. Today it’s on display at the Eagle Historical Society & Museums. At 81 years old, in 1940, he decided to make a prospecting trip to his placer mines at Seventy-mile, Alaska. The weather that November quickly turned on him. Realizing he was short of provisions and would unlikely make it home, he pulled up his parka hood and lay to rest, never to wake again. Later, his body was recovered and buried at the Eagle Cemetery. Ak = Alaska, our 49th state and a most exciting, beautiful place to live! Ethno = Ethnology (from the Greek '', ethnos'' meaning "people, nation, race"), the branch of anthropology that compares and analyzes the origins, distribution, technology, religion, language, and social structure of the ethnic, racial, and/or national divisions of humanity. Also, the collection I manage at the UA Museum of the North. If you want to contact me about anything you see here, drop me an email at angela.linn@alaska.edu. I'd love to hear from you!